If you believe that only the best stallion is good enough for your mares, then let your dreams come true! 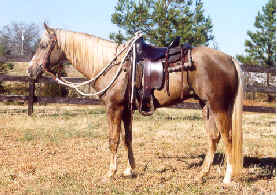 "Gunner" has excellent bloodlines, a great temperament, and more willingness and heart than any one horse should have. And of course, lets not forget those drop dead gorgeous looks! Selectively bred for performance by Bob & Dorothy Thomas, of Dawsonville, GA, "Gunner" has the size, mind and heart to get the job done. 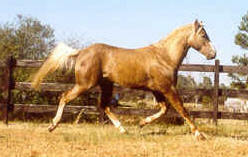 He is the product of years of breeding for the horse that can do it all. Whether you are looking for your nest Performance Champion, or breeding for that perfect Trail Horse, "Gunner" is proving himself each and every day. 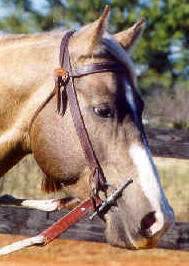 "Gunner" is the proof that stallions can have the willingness, gentleness, and heart that makes a safe and reliable mount. The best of everything the Quarter Horse world has to offer, "Gunner" brings to the breeding shed all the qualities that people say they want in their horses. Why wait for that "Special One" to come along? Breed for it, and know what you are getting up front. Come spend some time with "Gunner" and see if he will fit your breeding program. As "Gunner" travels the clinic circuit and gives rides to the most serious Dressage Trainers, and performs well in the cattle pen, as well as giving that pony ride to Downs Syndrome children and adults all over the country, his honesty, and gentleness shine through each and every time. When he is not out on the road doing clinics with me, he is the best trail Horse that I have ever ridden, and will cross anything you point him at, whether he has to swim, jump or crawl to get by. His first babies are yearlings now, and "Gunner's" ability to produce that beautiful "Chocolate Palomino" has been established. Thanks for taking the time to consider "Gunner" and I hope you stop by and visit with "Gunner" and I, either on the road, or at the ranch, and enjoy the company of one of the nicest stallions of all time.